Parent Pay, which describes itself as a market leading online payment and dinner money management solution for schools and caterers, is currently experiencing issues. The ParentPay portal isn’t currently working with users facing login problems. Unable to get onto the system today and can’t pay my sons dinner money?? @ParentPay are you going to reply to anyone's issues or are you just hoping it will sort itself out on it's own. @ParentPay I'm having issues tipping up my daughters lunch card. Friday I tried and failed a few times and this morning I can't even log in????? 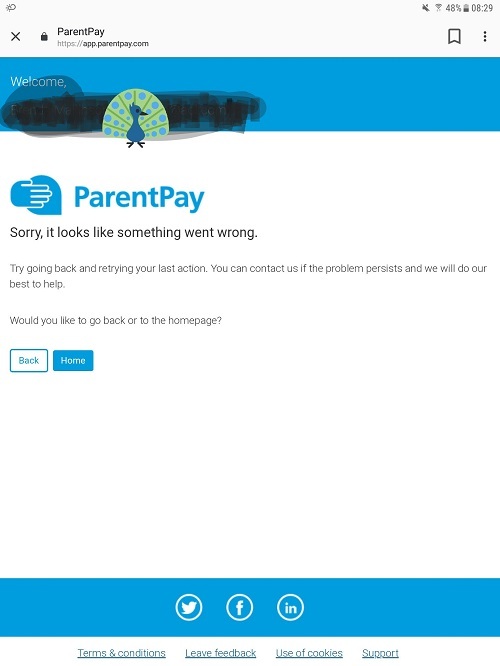 @ParentPay service wasn’t working Friday and now not working again today … This is a service so children can buy food at school , this is not good ??? As you can see, users are very annoyed with the service glitching out frequently and are demanding answers. Week 2 of serious problems? Please tell us what is going on and what you are doing to address the log in and payment issues. Has Parentpay been hacked? Is there something you're not telling us? While the problem continues, we’re yet to come across an official word from the company on the matter. Rest assured, we’re keeping an active tab on the situation and will update the story as soon as we have more info on the matter. Until then, use the comments section below to share with us your ParentPay experience. The company has acknowledged the problem saying it’s currently being looked into. Important: We are currently investigating an issue which is affecting parents/Carers attempting to make payments. We will provide a further update when this is resolved. Well @ParentPay that's progress I suppose. I wonder how many kids have now missed breakfast because your system doesn't work. Hi @Jack5teel007, CrieffHS pupils will be able to go to the canteen as normal and be served. Items will be added to ParentPay for payment at a later date. There have been issues with ParentPay since Friday which we hope will be rectified asap. Please be assured any student with low or negative balances on their account will still be served in the canteen. Hey @FOXTEL_Help @Foxtel just casually watching TV at home and your service cut out. No one from tech support answering and now i'm missed the end of my show. Any help for a long term customer you plebs? For its part, Foxtel has confirmed the issue, saying it’s being looked into. We’ll be updating this section with more information as and when there are any newsworthy updates. Until then, if you have any tips, drop by in the comments section below. @QuickBooks hi, cannot get into quicbooks online through web or app. Are there (performance issues)? Tried several network connections……. What’s good is the team behind the service is officially acknowledged the issue, and has said it’s being worked on. We're working on latency issues that's impacting QuickBooks Online. We're working on a fix and will be keeping this thread updated with progress. We are currently having an outage. If you could email us your email address in a Direct Message. We will email you to let you know when this is resolved. We’ll be updating this section with more information as and when there are any newsworthy updates. Until then, share your QuickBooks experience in the comments section below. Reports are now pouring in that the popular Mangago website is currently inaccessible. Mangago come back! I need you! There’s currently no information as to what happened, but we can confirm the site isn’t accessible currently. We’ll update this story with more information as and when we notice something newsworthy. Tumblr users rally behind Citrus Scale to circumvent NSFW/adult content ban – will it work?